A Pensacola man is facing criminal charges for allegedly running a financial scam that bears the typical characteristics of a Ponzi or pyramid scheme. According to a May 30, 2017 report in the Pensacola News Journal, the man was transferring money between investors and his attorney’s trust account. The criminal complaint revealed that the man deposited more than $2.2 million for the benefit of his clients, but then withdrew funds totaling more than 50 percent of that amount. The documents state that the man hid misappropriation of funds by disbursing them to clients that either didn’t exist or were misidentified. An audit revealed that the arrangement resulted in a $280,000 shortage in the trust account between 2014 and 2017. If you’re involved in a Ponzi scheme or other type of financial fraud in Florida, you’ll need an experienced attorney. The Ponzi arrangement starts where a person creates a plan, based upon fraud, and encourages others to join by payment of a fee. In turn, those individuals recruit others to join the scheme and they earn money from bringing others into the program. The term “pyramid” is used to describe the scam because it’s the original recruiter at the top, and the newer recruits fall under him or her. A Ponzi scheme is intended to endure indefinitely as new people enter the business and provide financial fodder to those higher up on the pyramid. The criminal element enters the picture because anyone who contributes to the scam doesn’t get a return on their investment: When there’s no one left to join, the pyramid crumbles. Florida has enacted the Deceptive and Unfair Trade Practices Act, which prohibits the use of a chain referral sales plan. This plan is defined as persuading a person to purchase a product or service, where that purchaser is promised additional money or items of value to recruit more members. Typically, a state agency will bring a civil action on behalf of other individuals to enforce their rights in connection with the fraudulent activity. 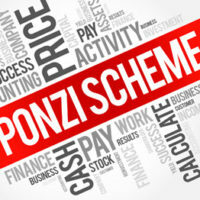 Willful violation of Florida law on Ponzi schemes could result in a civil penalty of $10,000 per incident. However, there may also be criminal charges depending on the circumstances of the case. If you’re facing allegations of a Ponzi scheme or other types of financial fraud, you could be charged under a number of Florida and federal laws. You do have rights, however, and any violation of them can be used to contest the charges in your case. The key is retaining an experienced criminal defense attorney who can start developing a strategy for your defense right away. You might be facing extremely harsh penalties, and a lawyer will protect your interests. For more information on pyramid schemes and financial fraud cases, please contact the office of Fort Lauderdale lawyer Kevin J. Kulik right away. We can answer your questions or schedule a confidential consultation.